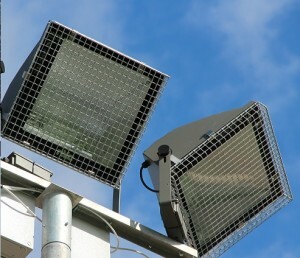 Aiano’s makes bespoke solutions for pole mounted floodlights at school and sports stadia. Aiano’s manufactured bespoke fitting-mounted wire mesh floodlight guards to protect floodlights at a brand new school in East London. The guards were mounted in a non-invasive way to the existing fixings of the MANITOBA floodlights. 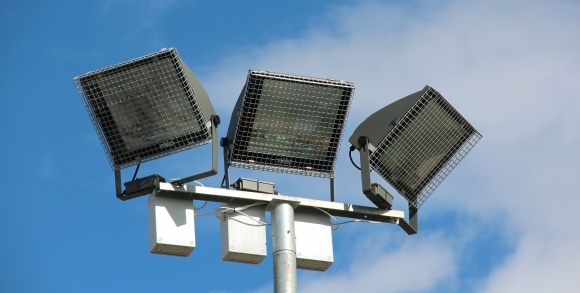 Aiano’s makes guards to fit directly to the floodlight unit for pole-mounted floodlights. 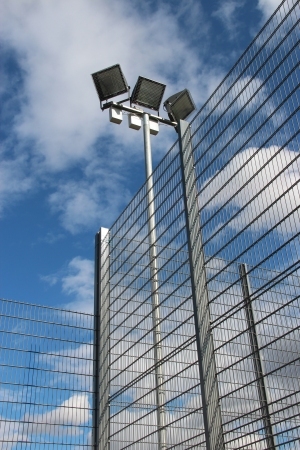 Wherever possible we design the guard so that it can be fitted in a non-wire mesh invasive way using the existing floodlight fixings. The guards are strong and well made from 25 x 25 x 2.64mm (1” x 1” 12swg) steel weld mesh on a 5.35mm (5swg) frame. AIANO floodlight guards are built to last. The guards are hot dip galvanized after manufacture. Hot dip galvanizing provides the most reliable long-term protection from corrosion after stainless steel. We can design a bespoke solution for most models and types of floodlights and we have a number of stock solutions for specific floodlights. Aiano’s keeps a wide range of standard floodlight and bulkhead guards in stock.